Ó Dochartaigh B É,Doce D D, Rutter H K and MacDonald A M. 2015. User Guide: Groundwater Vulnerability (Scotland) GIS dataset, Version 2. Revised Report. British Geological Survey Internal Report, OR/15/002. Groundwater vulnerability is the tendency and likelihood for general contaminants to move vertically through the unsaturated zone and reach the water table after introduction at the ground surface. It therefore accounts for intrinsic properties of the vertical pathway in the unsaturated zone (above the water table), whether within an aquifer or its overburden (superficial deposits and/or soil). It does not account for the movement of contaminants through the saturated zone of an aquifer after reaching the water table. The groundwater vulnerability (Scotland) Version 2 dataset is produced for use at 1:100 000 scale. The dataset is not designed to be used to assess groundwater vulnerability at a single point. All spatial searches of the map/dataset should be conducted using a minimum 100 m buffer. The groundwater vulnerability dataset was produced in ArcGIS by combining a range of environmental datasets (Table 2). A detailed description of the methodology for developing the groundwater vulnerability Version 1 dataset is given in Ball et al. (2004). This new dataset, Version 2, was produced along largely the same lines, with some small methodological changes to simplify the assessment procedure, but using updated input datasets. A rule-based method for combining the various input datasets to define a vulnerability classification has been used, which has been modified only slightly from that used for Version 1. The method is described in detail in Appendices 2 and 3. The input datasets used to produce Version 2 of the dataset are listed and described briefly in Table 2. More detail on how they have been amended from Version 1 is given in Appendix 1. Table 2 Data fields and parameter values used in the creation of the groundwater vulnerability (Scotland) Version 2 map: input datasets and final groundwater vulnerability class. SD_THICK Superficial deposits are only mapped where >1m thick. Thickness of superficial deposits was coded as follows: 1 (1-3m), 2 (3-10m), 3 (10-30m), 4 (>30m). Based on the first version of BGS’s superficial deposits thickness map (which was interpolated from borehole records) but modified applying expert knowledge to particular areas. For more information see Ball et al. (2004). CLAY Delineating those areas known to contain at least 5m thickness of clay within the superficial deposits sequence, either as a single unit or the sum of more than one unit. Derived from lithological log data held in BGS’s Single Onshore Borehole Index (SOBI) database. For more information see Ball et al. (2004). SD_DTW Depth to groundwater level in superficial deposits aquifers. This dataset is based primarily on a surface representing the depth from ground level to the river base level, which is modelled based on a digital terrain model (DTM) and the locations of major rivers, combined with HOST data showing areas where the water table is <2m. Four classes of depth to groundwater level are defined: 1 (< 3m), 2 (3 – 10m), 3 (10 - 30m), and 4 (> 30m). Developed by BGS for the purposes of the groundwater vulnerability map. For more information see Appendix 1 and Ball et al. (2004). BR_DTW Depth to groundwater level in bedrock aquifers. This is defined only for aquifers with significant intergranular flow. Four classes of depth to groundwater level are defined: 1 (< 3m), 2 (3 – 10m), 3 (10-30m) and 4 (>30m). Developed by BGS for the purposes of the groundwater vulnerability map. From the James Hutton Institute (formerly the Macaulay Institute) (Boorman et al 1995;http://www.macaulay.ac. uk/host/). VULN Code representing relative groundwater vulnerability, from 1 (very low vulnerability) to 5 (very high vulnerability). See Table 1 for how to interpret the codes. The groundwater vulnerability (Scotland) dataset, Version 1, was produced in 2004 by the British Geological Survey (BGS) and the Macaulay Institute (now the James Hutton Institute) on behalf of the Scottish Environment Protection Agency (SEPA), funded by the Scotland and Northern Ireland Forum for Environmental Research (SNIFFER). The dataset comprised a GIS- based groundwater vulnerability screening tool and an associated report describing the groundwater vulnerability screening methodology (Ball et al. 2004). This revised version (Version 2) uses updated input data and a slightly modified methodology to develop new GIS-based maps. 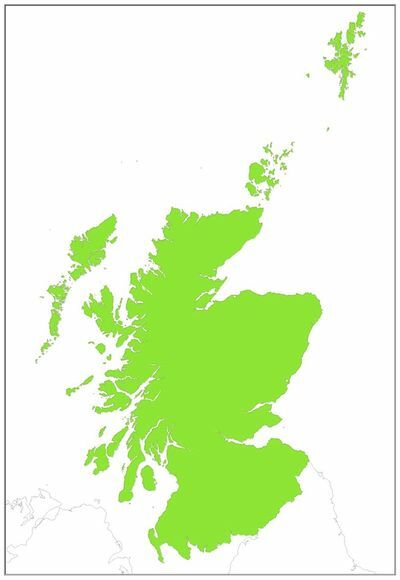 The dataset covers all of Scotland (Figure 2). Figure 2 The coverage of the groundwater vulnerability (Scotland) dataset. The groundwater vulnerability (Scotland) Version 2 dataset is available as a vector dataset that contains the final groundwater vulnerability classification only (Table 3, Table 1). The groundwater vulnerability map is designed to be used at a scale of 1:100 000, and not to assess conditions at a single point. All spatial searches of the map and dataset should be conducted using a minimum 100 m buffer. The map provides only an approximate description of ground conditions. Use of the map should be pragmatic, and the map is not a substitute for detailed site investigation. The groundwater vulnerability map is based on, and limited to, an interpretation of the data in the possession of the British Geological Survey at the time the dataset was created. The groundwater vulnerability map is subject to periodic revision, and any discrepancies related to updates to input data will be addressed in the next revision. ↑ 1.0 1.1 1.2 1.3 1.4 Ball D, MacDonald A, Ó Dochartaigh B, del Rio M, FitzSimons V, Auton C and Lilly A. 2004. Development of a groundwater vulnerability screening methodology for the Water Framework Directive. SNIFFER Report Project WFD28 / BGS Commissioned Report CR/03/294C. ↑ Ó Dochartaigh B É, Doce D D, Rutter H K and MacDonald A M. 2015. User Guide: British Geological Survey Aquifer Productivity (Scotland) GIS datasets, Version 2. Revised Report. BGS Open Report OR/15/003. This page was last modified on 23 July 2015, at 15:58.